Anatomy and Physiology was my favorite course in college. After spending a semester elbow deep in human cadavers, I returned the next semester as a lab assistant and began tutoring the subject to underclassmen. So ten years later, when my parents saw an ad in the local paper for an A&P instructor at a private college in our area, I decided to apply. But not without hesitation. I had never before taught at a college. I had never before taught A & P.
And did you catch that ten years had transpired since I had anything to do with A&P? But I had a few things going for me. I have a Masters degree. In a related field (physical therapy). I have a Masters in Education, too. Colleges like people with degrees. The more, the better. I had teaching experience. It was mostly one-on-one and in math, but hey. And it was mere weeks before the semester was due to start. In other words, the college may have been a little desperate. Thankfully, they only needed a lab instructor. Lab, in my opinion, is much easier and much more fun to teach. Sadly, we would not be dissecting cadavers. After just two semesters, the department chair tried to convince me to teach the lecture portion as well. “You know I’ve never taught A&P,” I reminded her. I managed to hold her off another year–until she realized it was only my perfectionism stopping me. “You on your worst day is better than any other option we have,” she said. Well, if you put it like that . . . 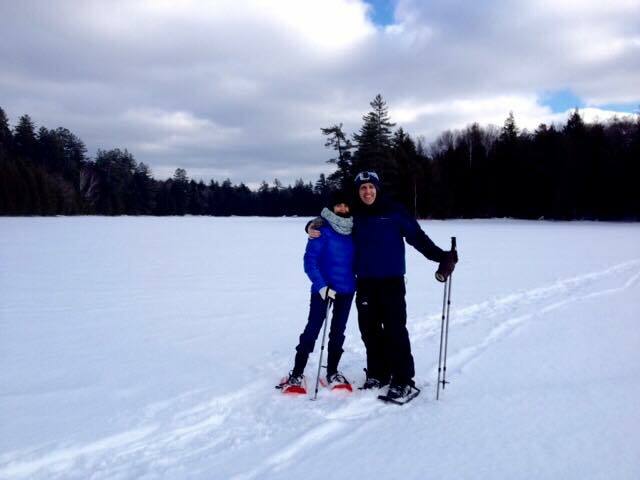 Surprisingly not cold, snow shoeing on Rich Lake. Fast-forward to December, 2014. When we moved to Schroon Lake I’d told Michael I wouldn’t stay past the New Year. It’s too cold. After not working for nearly a year (by choice), I felt like it was time to go back. And there weren’t many options in Schroon Lake. But Michael was excited to spend the winter here. The concept that the lake actually froze–to the point one could drive across it–fascinated him. He wanted to try ice fishing, and walk outside in below zero temperatures. I had none of these desires. But I had some ideas. I couldn’t decide what avenue to take next in life, but knew I wanted to teach. Of all the jobs I’ve had (and there have been many), they have all involved teaching in some form. The more I taught, the happier I was. I’ve read that you know you’re doing the work you’re meant to be doing if, at the end of the day, you feel energized. After I finish teaching, I’m on a high–I’m replaying what worked and what didn’t, excited for what I’ve learned, what changes I saw in my students, eager for the next class. So two days before Christmas, I e-mailed the department chair at the community college at which I taught four years earlier. Like most colleges, she had her spring semester staffed. But, like most colleges, things changed last minute. And so it was that I was given ten hours of courses to teach each week for the spring semester. “They didn’t even interview you?” Michael asked. Never mind that I was teaching two courses I had never taught before. Thankfully, one look at the syllabus and I realized I would be okay. Two-thirds of the labs were things I taught in my three years as an A&P instructor. And the other labs would not be that hard to brush up on. The college, however, is back in my hometown–three hours south of Schroon Lake. But the universe has a way of providing whatever one needs. The apartment over my parent’s garage, after having been inhabited continuously for more than thirty years by my grandmother, then my brother, then my youngest sister, was available. And so it is that I’ve become a commuter. I don’t teach on Fridays, so on Thursdays I head up to Schroon Lake. On Sundays, I return to the apartment that was once an oasis in my childhood: the place where I could escape the loud, chaotic life of siblings and parents, and take my spot on Grandma’s floor to attend her lesson on all things baseball as we watched the Mets games together. Grandma didn’t just teach me about baseball. She taught me how to ask nicely for things. She taught me that everything must be put back in its place after I use it. She taught me that BLT’s are a perfectly acceptable breakfast food (as are Entenmann’s chocolate covered donuts). As I open the two-inch think Biology textbook to prepare for next week’s class, I smile as I realize I’m living in the former home of a woman who taught me things I’d never find in a textbook. And for those of you wondering: yes, that list of all the wonderful things Grandma gave us–the one copied onto her tombstone–still sits on the windowsill. This all came back to me when I was looking at the offerings at the Hotel Spa Granada–the hotel where I study Spanish each morning. During my research prior to my trip, at least three sources recommended their spa–not just for their services but also for the price. And so it was that at 4 p.m. today I found myself in a half-underground room near the pool–the only air-conditioned place I’ve seen, let alone been in. I opted for the special that included a manicure, pedicure and thirty minute massage for a mere twenty-four dollars (and I’m told this is the “expensive” place in town). My masseuse greeted me in Spanish. I explained I spoke a little of her language–that I was learning. We exchanged few words that first half-hour because I was blissfully relaxed as her oiled hands pushed into my tight traps. It was a good thing we started with the massage, however, because as she ran her hands up and down my back, I thought of three things I could ask her in Spanish. And so it was that when I sat down for my manicure I began what would become a full hour conversation almost entirely in Spanish. How long have you worked here? Do you live in Granada? Do you work five days per week? As she filed my fingernails, I learned that Judith has spent four years working at the spa six days per week (from 9am to 6pm). And that problem in America where we study languages in high school and most of us come out of it not being able to speak a word? It happens in Nicaragua, too. Unable to speak English after studying it in high school, Judith took night classes at an English school and is able to practice by speaking to her clients. However, she told me she only speaks English if her client doesn’t know Spanish. For the first time in my life, that wasn’t me. I told her this was my first time in Nicaragua and in Central American, and that today was my second day of studying Spanish. Judith was impressed with my conversational abilities after my whopping eight hours of one-on-one lessons. And frankly, so was I.
I don’t profess to be a master at learning languages–a mere hour after conversing with Judith, I searched for words at dinner without nearly as much success. But if there’s one thing I’ve learned since I started teaching myself Spanish three weeks ago, it’s that the best practice is to speak–mistakes and all. It also helps to have a patient listener. And lucky for me, in addition to her skills as masseuse and beautician, Judith had that skill as well. It’s by now a familiar feeling–that combination of exhilaration and anticipation and fear, the near future mostly unknown, that natural high, the feeling like I’m so happy I could burst, that moment I know that this is why I travel. It hits me within the first few minutes of arrival in a new place–which is usually before I’ve even made it out of the airport. I don’t think I’ll ever replace the fear that hides among all of those other good things. At least not when I travel alone. As I see it, I have a healthy dose of fear–just enough to keep me on my toes but not enough to keep my heels firmly planted in my home country. Up until two days ago my major travels only took me to Europe and Canada with a few stops around the Caribbean. So Nicaragua is the shock to my system that I expected–but only a small tremor, certainly not an earthquake. I’m not so naive as to be too surprised at what I see. Granada is thirty miles from the Managua airport (into which I flew). Between the two, we drove by more than a few people using horses with carts as their mode of transit. I saw kids playing in front of houses made of corrugated metal, and understood how easily natural disasters could devastate countries like this. Watching over those children were parents or grandparents, and that got me to thinking of how simple life really is. Or can appear to be. A roof over one’s head. Food to eat. A companion along the journey. Time to play, time to work, time to help others. But as we arrived in the city, the frenetic pace of life returned. Cars darting around the people on foot or on bicycle. Motorcycles weaving in and out. A one way street of traffic at a stop, for reasons we can’t see beyond the truck in front of us. Tourists in the central square. Horse and carriages for them to see the city. Sidewalks lined with semi-permanent stands– their vendors selling produce, music, shoes, watches, eyeglasses. People walking in the street if the sidewalk is blocked by a vendor. I’m not a city girl but my solo self is not fearless enough to venture out into the countryside (give me time–this is, after all, only my first time in Central America). But behind the gates and doors along the street lie homes–like the one in which I’m staying–that have courtyards in the middle of them, common rooms open to the outdoors. I wouldn’t know I’m in a city when I’m in my room. That serenity is briefly interrupted by my walk to Spanish class–down the aforementioned street, which at 7:45 this Saturday morning already had many vendors with their wares on display. Three blocks later, I step through the open doorway into the Hotel Spa Granada, past the bubbling fountain in the middle of the first courtyard, past the Central American art decorating the walls of the second courtyard, into the third courtyard which is occupied by a pool–the far end of which is covered by a sloped Spanish tile roof, under which me and my teacher sit. Four hours later I head back home for lunch. (Today: spaghetti with a red sweet cream sauce, spiced rice, a fried banana and a salad.) My afternoons are mine to explore or relax. There’s certainly much more to see and do here. But ideally one strikes a balance between touring and resting. This afternoon I rest by writing. Reading. And if the temperature remains at 90, I’ll head into the pool. If clouds set in, maybe a walk. A future pleasantly unknown. I booked a flight today. To Nicaragua. I leave on Thursday. The semester starts in fifteen days. So if I wanted to get my January thaw in, it was time to act. Michael and I flirted with the idea of Grand Cayman. But for various reasons abandoned the idea. “For the money we’d spend going there, I could go learn Spanish,” I said, having recently come across a site I’d found last year for a language school. “I’m more a learning-vacation type, anyway,” I said. I realize I don’t have to go to a country to learn its language. But if you can, why not? And if that country has ninety degree weather right now, well, sign me up. Why Spanish? Well, I’ve always thought I’d love to speak another language. Fluently. My French and English allow me to communicate with lots of people when I travel. So when considering which language to work on, my first thought was to improve my French. But then I thought of the jobs I’ve wanted that required Spanish fluency. And Spanish is a darn good language to know if living in the US. Or traveling south of its border. Then there’s the Camino. English and French allowed me to speak with a good number of fellow pilgrims as we walked across northwest Spain, but I was often at a loss when it came to speaking to the innkeepers and other locals. “Oh, but what about Italian?” I thought next. The language of (some of) my ancestors. Oh, how I love Italy. I’ve hit the major cities, the Cinque Terre, the Amalfi Coast. But if I’m going to continue my genealogy research, I’ll soon be headed to the south of that country where English is not spoken nearly as widely. So I debated. And debated. And then got stricken with paralysis by analysis. Until I rediscovered Benny, the Irish Polyglot. A polyglot, I learned, is someone who speaks many languages. Benny went from being the guy who couldn’t speak a word of Spanish (after living in Spain for six months) to being able to pick up enough of any language to be conversational–in a few hours. His advice for how to choose which language to learn was this: pick the one you want to be able to use next. For me, that’s Spanish. Most every trip I’ve taken abroad is to Europe. And if I had to guess where I’d go the next time I’m over there, I’d bet money I’d be back on the Camino. Yes, I realize Latin American Spanish is different from Spain Spanish, but my goal at this point is just to be able to converse and be understood. And I’m pretty sure knowing any Spanish is better than none. So I’m off. In 72 hours I’ll be living with a Nicaraguan family with whom I can barely communicate. I’ll take a few hours worth of Spanish lessons each day. And hopefully, by the time I say good-bye to my hosts, we’ll have had some great conversations. Wish me luck.